Davide Valsecchi has been announced as the Lotus team’s third driver for the 2013 season. 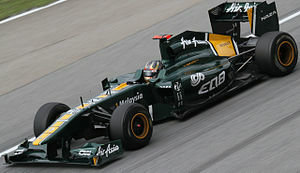 The 26 year old Italian was Team Lotus (now Caterham) test driver in 2011, and made his F1 weekend debut at the 2011 Malaysian Grand Prix when he replaced Heikki Kovalainen for the first Friday practice session. He then went on to win the GP2 championship in 2012 and tested for Lotus at the Young Driver Test in Abu Dhabi at the end of last season, impressing the management and engineers sufficiently to secure a more permanent role with the team. “I’m really happy that the team want me on board and I’m excited about the future,” Valsecchi said. “I hope that this is a really good start to a career in Formula 1. “Every day I will do the very best job that I can to give Lotus F1 Team the same passion and commitment that I showed last year. My last season in GP2 in 2012 was something I really focussed on, and in the end I succeeded. Now in Formula 1 my target will be a little different, but my focus to do the very best is still the same. The Lotus driver line-up seems to be continually expanding – Valsecchi is now the team’s third driver, joining current reserve driver Jerome d’Ambrosio, development driver Nicolas Prost and race drivers Kimi Raikkonen and Romain Grosjean to bring the number of drivers at the team to five. With testing limited to just 12 days in the pre-season and only some limited straight-line testing during the season, the three non-race drivers are unlikely to spend much time in the E21 that was unveiled yesterday.